I bought some cool Edison style light bulbs a while back and just thought I needed to try this industrial thing. My office is very modern and it work for me. I wanted to look like someone was locked in a basement with a bunch of junk and needed light, so they cobbled together whatever they could and came up with this. In all truth it’s kind of what happened! Very cool. I love the Steampunk stuff — some of it is pretty intricate, and visually appealing. You certainly captured the steampunk look. I like the look of the bulb, but how much GLARE does the bare bulb put out just sitting on your desk like that. Ands is the bulb/socket SUPPOSED to hang by the wires? There is literally no glare, it is a 40Watt bulb and it’s a very orange light. I couldn’t even read by it. I think the iPhone camera makes it look intense. As for the wire, yeah that was my intent. I knotted the wire, so there is no real weight on the screws. 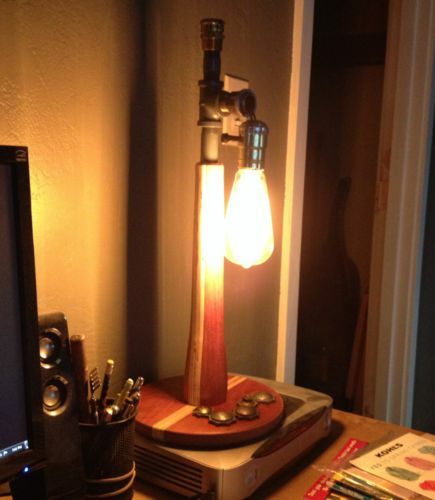 Nice looking lamp! I like the industrial look to it. Nice lamp. I, too, like steampunk , which is kinda weird for an old guy, huh? Very Nice Work Indeed Peter! Thanks For Posting.